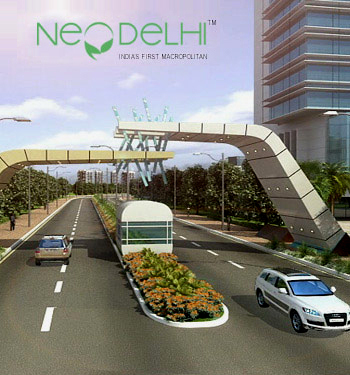 Neo Delhi a 500 acre, integrated township is the flagship project of the company. It is just 25 kms from the Delhi border and accessible by the Delhi Metro and 6 lane highway. The project which will offer the best in new-age urban lifestyles and world-class amenities is being promoted by Alliance Promoters Limited and co-promoted by the Khaleeji Commercial Bank â€“ Bahrain and Emirates Islamic Bank â€“ Dubai in association with the Signature Group, Dubai as an asset management company. Variety of living options available in the form of Villas, Country Homes, Apartments and Independent Homes and variable Budget Homes are spread across an area of 190 acres. The spaces would be an example of splendid architecture with interiors tempting the sight and the openness caressing the soul. Every area would be an exquisite blend of comfort, class and luxury. With 165 acres of land dedicated to landscaping, road infrastructure, expanse of greenery, open spaces, tree lined wide internal roads, landscaped gardens with enormous water bodies and nature decked jogging tracks. Designed for the pre-eminent living experience at par with global standards the township would offer 115 acres of spaces dedicated for Commercial centers, Retail spaces, Malls, Entertainment zones and amenities in the form of Schools, Hospitals, and state of the art clubhouses with outdoor & indoor sports facilities, swimming pools, etc. shall form an integral part of life in this future township. An area of 30 acres is also dedicated for raising eco friendly IT/ITES and non-polluting industries in the township.